Innovative platform connecting high profile clients with creative minds in an exciting, fast video-based pitching contest. Next generation social media format. The usual path to procuring creativity and a communication campaign is through an advertising agency; be it for the promotion of a launch for a new product or to promote your brand more generally. We work differently, but are at least as effective and in line with today's trends. A picture says more than a thousand words! We tell the story from start to finish: a client posts a video on our open platform with their creative need. Creative minds respond by pitching a short video with their idea or design. The public can vote on the Top 5 pitches selected by the client. Then the client selects the best pitch and together they develop the idea to deliver the final result, again shown in one or more short videos. a larger online reach and more interactivity with the target audience, lower cost compared to the traditional 'closed' process, and more creative ideas. The best pitches are rewarded with good prizes and big exposure. In fact our platform and format is a powerfull procurement channel for more creativity ánd a communication channel to reach target groups. Please watch our compilation video of three examples at: https://www.youtube.com/watch?v=cUvCtbK7tzA. We have clients in all sectors and have an innovative business model with various sources of income. “We are proud of the thousands of creatives on our platform. As part of our strategy we started to develop the Created on Friday tv-format as well to run alongside the online platform, making use of the online video content and community”, according to Wouter Cooijmans, founder. Please note that the rest of all company info below is from our crowdfunding campaign in 2013/2014 and thus is not on every topic accurate anymore. We are in the next stage now after a restart.. Created on Friday is a video-based platform in which clients, creative minds and followers are connected in Creation Stories. In several categories - design, music, fashion, models - launching new products, services or social problems, the client can submit a Call for Creation video. This happens on the first Friday at midnight. During the first week creative minds (free-lancers or companies) show their three pitch videos in which they present their solution for the clients' problem. The followers vote for the best ideas. This way a dynamic Top 5 arises on the basis of video views and votes during the first week. Of course the client follows the submissions as well. The client's favourites are presented in a frame on the client’s Call for Creation page. This way the client can influence indirectly followers’ voting behaviour. Exactly one week later, on the second Friday at midnight the Top 5 is frozen. During this Friday the client determines who is going to be the winner out of the Top 5, and he will announce this in the course of the day through the online platform. During the second week client and winner come together to work on the Final Creation, which will be delivered on the third Friday. The client is responsible for the resources to deliver the Final Creation to highest standard, e.g. recording studio to finalize a track. The dynamics of the Created on Friday platform leads to two-week Creation Stories in which all three actors - client, creative minds and followers - are involved. The short story starts with a problem and ends with a solution, which will be implemented. As one of the actors, you want to know the end of the story. You want to stay involved because of the quick and dynamic process, which you can influence..
To support our exhibition at the Dutch Design Week in October 2013, we piloted two Creation Stories, although on a moderate scale, offline and without public voting. However, the pilots did include real Calls for Creation, submitted videos, a Top 5, the selection of a winner and the joint delivery of the Final Creation. We developed a prototype of the web platform on iPad so that visitors of the Dutch Design Week in Eindhoven could test the format and its content. A short description of these two Creation Stories, with links to the supporting <videos>, is included below. "The Sitcom!" is a concept of Lucas Maassen (designer) for the Dutch Design Week 2013. Each Sitcom needs a theme song, and that is why Created on Friday was used as a test. The Singing Chair was the client who placed the Call for Creation <video>. The client delivered the lyrics that the musicians could freely use to create their composition. The submissions from the Top 5 <video> were very diverse. The winner was Woody Veneman, who developed the idea into the Final Creation <video> during the second week. (Note: the game Fruit Fever is still in the beta stage, but can already be played. However because the game is still in its development stage, the final trailer will have to be updated in line with the game that will eventually go live). A large local authority needs a new art object in a public space; e.g. a large mural as a statement for the city. By using Created on Friday several local designers can show their talents to the client and the general public. Even if you do not reach the Top 5, you may nevertheless get a new job, because others have seen what you are capable of. The followers, in this instance probably many of the city's residents, have made a preselection for the client: the Top 5. It can therefore be expected that there is public support for the new artwork. On the third Friday the new design is presented. In this case the Final Creation is an agreed design that will be produced afterwards. In case of a mural the final result can be shown on the third Friday. In other words expedient procurement of creativity, with real results within two weeks. That's Created on Friday! A famous brand is about to launch a new product, but is still looking for a model for the communication campaign. Models agencies and independent models show in short videos what they believe is needed for a successful campaign. The public, followers of the model category, watches all the videos and votes for its favorites. During the second week the winning model will be working in the studio on a photo shoot, and on the third Friday the campaign can go live. Afterwards you can see and recognise in every bus stop and shelter your favourite model. Once Created on Friday is well established, Calls for Creation can also be placed worldwide. It will be some time before this happens, and these calls are likely to be few and far between. However, one such example could be Lady Gaga (supporter of new talented fashion designers) in need of a special dress for a gala in two weeks. She asks Created on Friday for help and places her Call for Creation. From all over the world talented designers show why especially their design would best meet Gaga's expectations. At Gaga's cost the winner is flown in the second week, which in itself is a great opportunity for a short video. Holland's recent 'King’s Song' (Koningslied) could have been created through Created on Friday. The service to the followers is the Created on Friday app. The app works as follows. You start by choosing which creative categories you want to follow; for instance only design and fashion, or all Calls in your region. You can also subscribe to a creative mind with an interesting first submission. This way you will be alerted when they make their second or third submission. Created on Friday adds value by connecting the three actors through Creation Stories. Market research during the Dutch Design Week in Eindhoven has shown that the client is willing to pay a fee for this to Created on Friday. To enter the market successfully we initially want to keep this fee low to quickly increase the number of Calls for Creation. This is our strategy to be profitable as soon as possible. On the other hand, form the start the client will be required to pay an attractive fee to the Top 5 to get high quality submissions. Our present financial forecast is based on launching Created on Friday in only a handful of carefully selected markets, using only the above mentioned sources of revenue. However, we will develop plans to enter more regions if there is a demand for this. It is our intention that participating in Created on Friday is free for both creative minds and followers by using the app. If Created on Friday becomes an international success and a strong brand, new revenue sources will be available; for example through advertising on the web platform and in the videos, by selling of visitor data, or possible licence revenues by links with other media. A private variant of Created on Friday is also possible if clients want to invite their own selection of creative companies to come up with ideas judged by a special internal voting committee. But then you don't have the power of the crowd following the Creation Stories and that's what our main focus is on now. First work hard on making Created on Friday a reality online in The Netherlands and The United States. And then evaluate and make new plans and set new goals. And if we can manage to generate new sources of revenue in the future of course we will share this revenue with the talented creative minds. What are the Unique Selling Points (USP's)? Followers: you have influence, you are involved; you can discover new idols with exceptional new creations; there is excitement in who will reach the Top 5 and who will be the winner; immediate: it is as if the paint is still wet when the video is uploaded. Media: entirely new way of generating interactive content; format with growth potential; design of new reality (meaningful); scope for integration within existing TV-programmes ('online format within a TV format'); international aspirations. It is an entirely scalable product because it is internet-based. However at the launch we do follow the principles of guidance and control in the chosen markets where we go live. The first Calls should be of highest possible quality, meaning well known clients attracting high quality submissions so that the public is going to follow the Calls with great interest. Pending the demand of the market, we will have plans ready to scale up expediently. For which target groups Created on Friday is of interest? Creative minds in all categories belong to the target group: designers, musicians, fashion designers, models, video editors, artists etc. This includes both independent contractors as well as creative companies. Again we expect that any innovators will embrace this new open pitch first, followed by others later. The followers are all those interested in creativity, who like to be involved through the IT-platform and app. How large are these target groups? All three groups are large. Market research on the Dutch Design Week showed that there is a lot of interest in Created on Friday; from potential clients as well as from the perspective of creative minds and followers. We intend to go live in a selected number of densely populated areas with top quality Calls to win over (and keep) the public (the followers) for Created on Friday. Once Created on Friday is well established it will be possible to place more locally focussed Calls, from smaller companies and less known brands. Obviously the fee the client pays to Created on Friday and for the Top 5 will be lower. However, this widening of the strategy will only be followed after Created on Friday has firmly been established following a high quality launch strategy. What about the competitors (rival products)? Currently there are no directly comparable products or services. Created on Friday is in its design unique. There are crowd sourcing platforms, but none include all creative categories. More importantly, these platforms do not have an open pitch approach with videos where the public can vote. They also lack the tight time-driven process leading towards a final creation. As a consequence it is difficult to identify the three most important competitors. If in the future Created on Friday gets a large community of followers who spend a lot of time online watching videos and following Creation Stories, this is likely to be at the expense of other media products; be it TV or online entertainment. However, we are now first focussing on our strategy to put Created on Friday firmly in the market and to build a growing Created on Friday followers community with the app. The size of the market consists of all areas around the world with a fairly high population density, where big companies operate, and where many creative minds work. However, our deliberate strategy is to be strong in a few selected areas first before expanding to other parts of the market. Our ultimate ambition is to have as much market coverage as possible to maximise the added value of Created on Friday. Before we enter new parts of the market, we will investigate the different cultural aspects that could influence our strategy for entering these new markets. How many clients does Created on Friday have? We currently have two reference cases and clients as set out in the Creation Stories above. We furthermore are in dialogue with Bolletje (Food industry) about a possible Call for Creation to support one of their commercial campaigns. Created on Friday is also in discussion with Solar Weekend (Event industry) about a Call for Creation to support its business. We are also in contact with a number of local authorities to explore how Created on Friday could assist. How many clients will get involved next year? In our forecast we worked out the minimum number of Calls required. For each market that we enter at least one Call for Creation will go live each week; in six different categories. The Netherlands should be considered as one market. Each week you have one call in the category design, music, fashion, models, the launch of new products and for instance the category games. Because of the preparation of the launch in 2014, we have assumed 25 weeks times 6 Calls a week: a total of 150 Calls in 2014. Each Call may have a different client, although there may be some that place multiples Calls. In addition to The Netherlands we plan to go live in 10 other markets regions, leading to a further 1500 calls. Following discussions with current investors, stakeholders and advisors we came to the conclusion that it would be too much risk to only launch in The Netherlands. If for whatever reason the launch in The Netherlands would fail, entering any other markets would be near impossible. For this reason we have decided to spread this risk and launch in the UK and then the US shortly after the launch in the Netherlands. Our market research at the Dutch Design Week also showed us that from a cultural point of view the USA would be a good market to launch, because of the generally outgoing and competitive character of the Americans. By launching in multiple regions, the risk of failure in one region can to some extent be compensated by the success of a launch in another region. 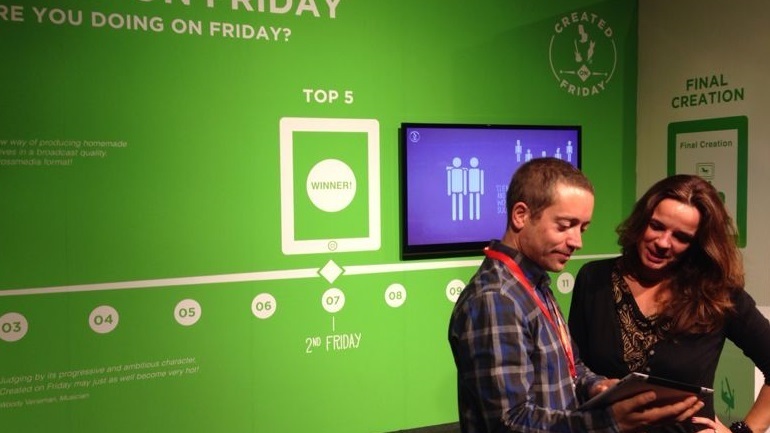 This strategy maximises the chance of success of an innovative format like Created on Friday. We are currently trying to find the right partner in the USA; one that can provide a capital investment ánd has a wide network to deliver (launching) clients. In exchange this partner will become a key shareholder in Created on Friday. In short, we will enter both the Dutch and the U.S. market for finding the right partners to launch ánd for the needed total capital investments. Besides our crowd funding campaigns. (Update July 2014: at the moment we have US informal investors on board, which gives confidence!). What activities have been undertaken and what was the result? There have been a number of marketing activities. At the end of 2011 we pitched the idea for Created on Friday on Facebook and Twitter for a short period, leading to a positive response from the media, creative minds and the general public. The subsequent networking led to collaboration with Enjoy Media with whom we produced the Created on Friday animation video. A second important marketing activity was the participation in the Dutch Design Week. For nine days we were able to interview hundreds of visitors from which it became apparent that something like Created on Friday doesn’t appear to exist anywhere across the world and that there is a need for something new like Created on Friday. We were also able to give a demonstration of the format with the prototype IT-platform on iPad, including the content of the pilot Creation Stories. In addition, through the Dutch Design Week we have made new contacts, including a long contact list with interested clients, creative minds and followers to start up our community. Which marketing activities are required? A lot of marketing activities are needed. Communication is the key success factor for the launch of Created on Friday. In fact, this crowd funding proposition is a communication action to explain to potential investors what our plans and ambitions are. Crowd funding is one goal, finding the right partners is another. Through crowd funding on Symbid we aim to accelerate our networking activities in the search for the right partners, so that we can launch as soon as possible. Created on Friday is placed in the market step by step. The first two reference pilots are a fact. The next step, as part of the marketing campaign, is the (international) launch in the Netherlands. We are currently working on the details of at least ten new Created on Friday calls; all in different creative categories. From a kick-off call in public space to the more bigger calls with great clients and international creative teams. The purpose of the launch is to show stakeholders and media the full breath of our concept through these at least ten Created on Friday calls. If the launch is a success we will start the internationalization stage as soon as possible. The extremely valuable market research that we carried out at the Dutch Design Week, will be supported by independent market research in each market where we plan to launch Created on Friday. We are hopeful that we will be able to attract media attention by publishing similar positive conclusions through press releases. Again this helps us prepare the public for the launch. Shortly before going live, we will produce one or more new overall Created on Friday promotional videos to be distributed online. This can include the content of launching calls. In addition, when the IT-platform is ready we will produce a ‘how it works’ video for clients, creative minds and the followers using the app. magazines: contacting magazines in the creative categories of Created on Friday for publication of articles. Some appointments have already been arranged. And this autumn Publish Magazine already published a short article about our concept and the future possibilities. This fan base, the Created on Friday Followers, is the second reason why we will focus on this specific target group in our communication campagnes. Creative minds build up their fan base in their own environment in the first place. We think that their friends will support them as a Created on Friday Follower and will download and use the Created on Friday app. These Followers are also in the same age as the Creative minds, about 15 to 30 years old. So our communication campagnes will focus on people related to creative educations ánd to their environment; young people interested in the categories of Created on Friday, e.g. design, music, fashion, models etc. And don't forget this young target group grew up with digital communication and online video. This communication focus is also of interest for Clients because they can actually build up a client consumer relationship with young people supporting their brand strategy. For the Created on Friday organization it results also in a focussed search for the right Clients. Furthermore because every year you have new talents leaving school we can continuously let grow the community of Created on Friday. It's not that we don't communicate to Creative minds and Followers above the age of 30, on the contrary, the bigger the community the better, but focus on young people is most effective in terms of costs and get new Creative minds and Followers every year. This communication strategy guarantees an effective launch in the first place as well as a continous growth of the community in the future. And an effective spin-off of the communication focus on people related to creative educations is that we will be able to find ambassadors in the field of management of these educations resulting in free publicity. This will bring down communication costs and a higher return on investment. What is the growth forecast of the company value during the first year? It depends on many factors. Created on Friday is new. How successful will the launch be? Is it necessary to execute plan B or plan C quickly? There are many ways to make operational adjustments, including by offering followers financial incentives; e.g. by giving winning prices for voters, etc. Or an extra bonus for creative minds. These influence the cost structure of the company. It is therefore uncertain what the growth of the company's value will be during the first year. However, our comprehensive launching strategy provides a solid foundation for healthy growth. What investments in the company have so far been made? Investments for securing of the intellectual property and the production of the animation video (10,000,- euro). And then since the company was founded in July 2013, a total of 250,000.- euro has been invested in shares (35,000.- euro by the founder). What is the total demand for capital and what part should be covered through crowd funding? Created on Friday's current total capital need is an estimated 660,000.- euro. When Created on Friday was founded in July 2013 for 150,000.- euro of shares were converted to certificates (‘winstdelingscertificaten’). Selling these certificates directly to the first crowd funders generated revenue for the day to day running of the company. From this 150,000.- euro in shares we are now offering 50,000.- euro on Symbid. The other certificates are being sold through our own site www.createdonfriday.com. What is the current turnover and what is expected turnover for the first year? The current turnover is zero. The costs of the first reference pilots were fully financed by Created on Friday. The expected turnover for 2014 is 825,000.- euro. To try to create a viral when we go live to attract a large group of Created on Friday followers and also aim to retain this group of followers.